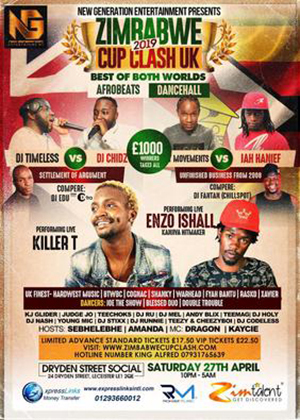 Dancehall artiste, Bazooker is expected to hold his maiden performance in the UK this May. The chanter popular for hit songs like Mababay akawanda, Handika and Kwedu is billed to perform at the “Hashtag Culture Zimbabwe Culture Day” on May 18. The show is set for Newbold On Avon, Rugby Football Club in Rugby. Dream Team Entertainment is behind the show. Kudzaishe Chipadza from Dream Team Entertainment confirmed the news. “We are very excited to be hosting the talented Bazooker for his show in the UK. “The one day festival known as #Heritage is quite a big show and stage for the artiste as it attracts people from within the UK and beyond, both as participants and attendees. “The day will artistically showcase our Heritage as Zimbabweans. “The main purpose being to seek to (re)discover, protect and promote the unique multi-factions of the Zimbabwean heritage thorough all forms of arts such as the variations of Zimbabwean music, media, performing arts and general art work. “We are also about ensuring a sustainable future for this heritage is of concern to all of us who care for the preservation of Zimbabwe’s spirit, soul and memory.